Can you trust a spammer if he offers you a spam-free email inbox? That's the question that a FanBox user needs to ask himself or herself. 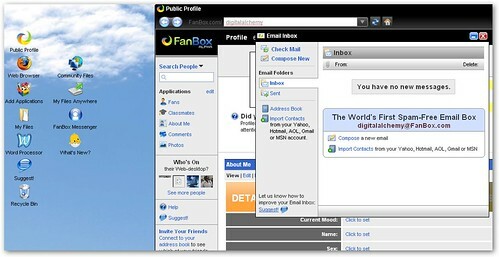 FanBox is a notorious company that is alleged to phish the passwords to your email accounts and send spam to your friends' email accounts. They ask you to import your email contacts from your webmail account, and then mercilessly spam your friends without permission. At first glance, FanBox looks like any other Web 2.0 site with a lot of eye-candy and heavy use of AJAX. It looks innocuously like any other web desktop site, offering file hosting services, a word processor, instant messaging, and a social networking service. However, the FanBox feature most heavily touted is their 10 GB spam-free email box. How the "FanBox Spam Protection Shield" works is a mystery, but presumably a spammer is most qualified in detecting email spam. I have to admit to being fooled into signing up, but doing a little more research revealed a very different picture. FanBox was previously incarnated as SMS.ac, an SMS messaging company that specialized in SMS message spam, which can be very costly if you are fooled into replying. Their email spam comes in a variety of forms: you are told that you signed up for FanBox even though you haven't, a friend you didn't know you had asks you a question, or a stranger just decided to become your fan and wants you to join this site. It looks like FanBox may just be the next generation of spammer, one cloaked in the guise of legitimacy, but still up to the same tricks.